I'm a huge fan of the cannoli and will always stop for one (or more) when I am visiting the old neighborhood. 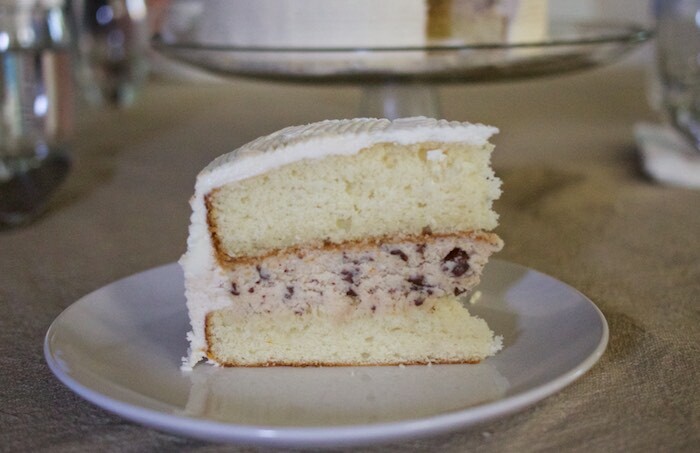 This past weekend I wanted to make a celebration cake for my Uncle's birthday and after much deliberation decided to put together a "cannoli cake"
I started with a classic vanilla buttermilk cake and layered it with a delicious chocolate studded mascarpone & ricotta filling. 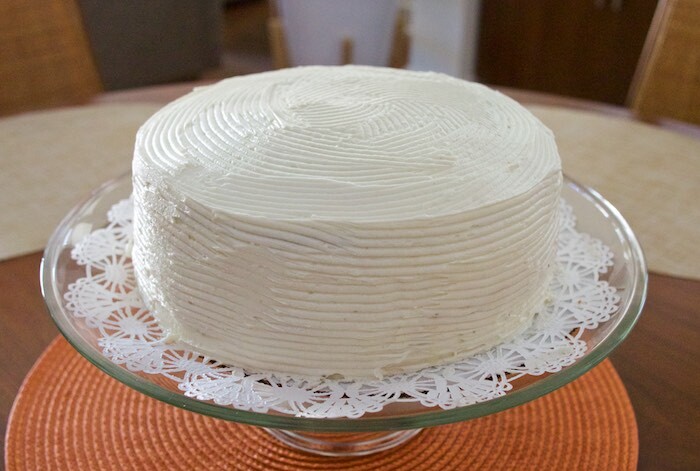 I topped the entire cake with an Orange Cinnamon Buttercream. Though obviously not a cannoli the combination was delicious!! Preheat oven to 350F. Grease and flour two 8" cake pans and line with parchment. Using a stand mixer fitted with a paddle attachment, cream butter and sugar on med-high until pale and fluffy (3-5 minutes). Reduce speed and add eggs one at a time fully incorporating after each addition. Add vanilla and mix again. Add flour mixture and buttermilk in alternating additions; beginning and ending with flour. Be sure to fully incorporating after each addition. Bake for 30 minutes or until a toothpick inserted into the center comes out clean. Place cakes on wire rack to cool for 10 minutes and turn out onto wire rack until ready to fill and frost. Beat the ricotta and mascarpone until smooth. Add in the sugar, vanilla, cinnamon, orange zest, and salt, until combined. Fold in the chocolate, and refrigerate until ready to use. Beat the butter and sugar until creamy and light, about 5 minutes. Add in the vanilla, cinnamon, half & half and Grand Marnier and mix until creamy.